Chocolate has been the favorite of most ladies and thus it’s a great way to celebrate this Valentine’s Day with a dish not of sweetness but with a twist of savory and spicy delight. Let me share with you this simple concocted savory chocolate sauce that would go with just any meat dish, whether it’s grilled, baked or even batter fried to your preference. 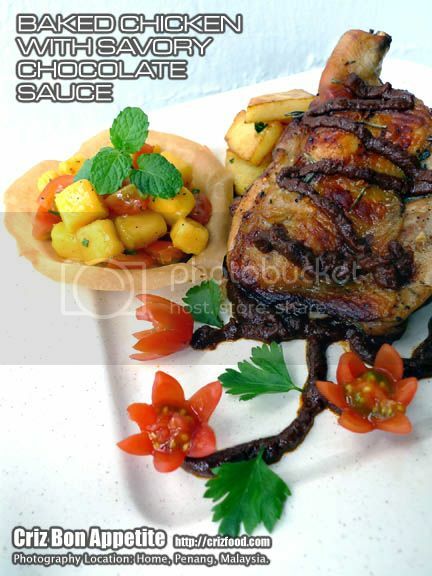 As for Valentine’s Day, I would couple the sauce with my baked chicken dish which I would call it as BAKED CHICKEN WITH SAVORY CHOCOLATE SAUCE. • Marinade the chicken pieces in a sealable plastic bag with all the ingredients above for 2-3 hours in the chiller. Use a fork to poke through the meat evenly for better flavor. • Remove the chicken from the chiller and let it sit at room temperature for about 20 minutes. Heat the oven at 200°C for 5 minutes and arrange the rack in the middle. Bake the chicken for 40-45 minutes or until the skin has turned golden brown. • While waiting for the baked chicken, blend the chopped big onion, garlic, cumin, grounded nutmeg and grounded cloves until fine. • Heat up 2 tablespoon of extra virgin oil and sauté the blended ingredients until fragrant. Pour in the tomato puree and the rest of ingredients and stir thoroughly. Add in some hot water to get your required thickness. • For Side Dish #1, melt 2 tablespoons of butter in a pan and sauté the sliced potatoes until cook. Add in the chopped parsley and some sprinkles grounded black pepper to taste. • For Side Dish #2, just toss everything in a bowl and keep in the chiller until needed.